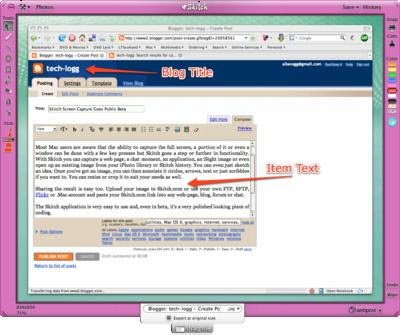 Skitch.com is a web service that works hand in hand with an application to give you simple but powerful screen capture facilities on a Macintosh, the results of which you can then upload and share on the web. Most Mac users are aware that the ability to capture the full screen, a portion of it or even a window can be done with a few key presses but Skitch goes a step or two further in functionality. With Skitch you can capture a web page, a chat moment, an application, an iSight image or even open up an existing image from your iPhoto library, hard drive or Skitch history. You can even just sketch an idea. Once you've got an image into Skitch, then you can edit it like you would with most other image editors. You can flip, resize, crop or rotate the image. You can add stuff like circles, rectangles, lines, arrows, text or just scribbles if you want to. Skitch automatically smooths hand-drawn lines as well. On top of that, all of the elements you can add to an image - shapes, arrows, text, etc. can be grabbed and moved, edited, resized, recoloured, etc. Sharing the result is easy too. Upload your image to Skitch.com or use your own FTP, SFTP, Flickr or .Mac account and paste your Skitch.com link into any web-page, blog, forum or chat. The Skitch application is very easy to use and, even though it's still in beta, it's a very polished looking piece of coding with loads of options and lots of built-in help and online tutorials. The only other free solution that comes close at the moment is The Jing Project, which works on both Macs and Windows although it does screencasts as well as sceen captures. Unfortunately, there's no indication that Skitch will remain free once out of beta but I suspect not as the developers, plasq.com, sell a few other graphics products like Comic Life and Doozla. That said, they are pretty inexpensive so Skitch may not burn too deep a hole in your pocket if you get too attached to it now.